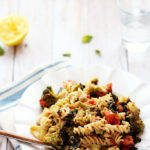 This vegan and gluten-free roasted broccoli-pepita pesto pasta is intensely satisfying. Plus, it’s packed with calcium, iron, vitamin k, vitamin c, chromium, folate, manganese, vitamin e, and magnesium. I wrote and rewrote the first sentence to this post approximately 12 times. I also edited and re-edited these photos 3 times. I know myself well enough to know what this quirky tango of indecision signifies in my life: I’m frazzled/exhausted from burning the candle at both ends (and in this case, probably in the middle too). So instead of leading in with a sentence about the goodness of this pasta (both in terms of taste and nutrient content), I’m speaking my truth of the moment before digging into the deliciousness. Because sometimes the only way around the clutter is to walk right on through it. Heyyyyyy, Clutter. Whatcha doin’ in my way? Pick it up, examine it, clear out what you can, and return what’s meant to be to its rightful place. And that’s just what I’m doing, albeit through it bleary eyes. I’m grateful. For this space and for each of the connections that have come into my life through it. This is where I come to breathe, to create, and to live out a bit of my day-dreamy notions. Thank you for being patient when I take way too long to reply to emails/comments, miss a regular post, or go MIA on social media for a few days. I’ve received so much kindness from you all, and it makes the frazzled weeks feel a bit more tamed/keeps the inspiration flowing. 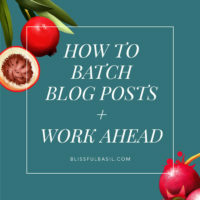 Somewhat ironically, I’ve received an influx of emails and comments lately with inquiries about how I balance working full-time, developing recipe concepts, regularly posting on the blog, and writing a cookbook. So many, in fact, that last week I started outlining a post centered around those very questions. 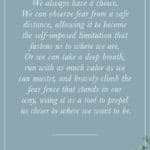 But once I started writing the outline, the real yet not so glorious truth unveiled itself: I often don’t have balance. I have moments of balance across those three aspects of my life, but the other parts sometimes (eek, frequently) fall to the wayside. Things like quality/non-rushed time with loved ones and friends, yoga, meditation, reading, watching documentaries (aka one of my favorite things ever), etc. I’m not sharing this to vent or to garner even the slightest bit of sympathy, because I’ve chosen to hold the space for each of these things in my life. Rather, I’m sharing it because I don’t want to give the false impression that I’ve got all of life’s balls floating through the air in a perfect juggle. Sometimes I drop the balls and sometimes I even trip on them. Crazy balls. 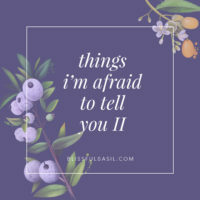 All that being said, I’m still going to write the post, and it will detail how I strive to find balance and keep myself organized during extra busy weeks. I’ve had a lot of trial and error with it, and I’m happy to share the good, the bad, and the crazy. Stay tuned for that post sometime in the next couple of weeks. Until then, let’s strut through that life clutter with a bowl of nourishing pasta in our hands and the fiercest Yes, I can attitude in our hearts. 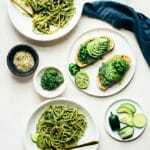 This pesto idea popped into my mind when I saw a tray of roasted broccoli on Pinterest a moment before I drifted off to sleep. The idea jolted me awake just enough to type “roasted broc, pepita pesto” into my iPhone notes. Believe it or not, when compared to some of the indecipherable recipe idea notes that I’ve mentioned in the past, this one has an articulate glow to it. 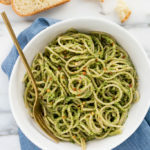 Last weekend, I set out to recipe test this pesto idea and was thrilled when it came together on the first try. It’s full of flavor and rich with vitamins and minerals thanks to the broccoli and pepitas. It’s packed with calcium, iron, vitamin k, vitamin c, chromium, folate, manganese, vitamin e, and magnesium. Not too shabby for a bowl of comforting pasta. To make it, you’ll roast fresh broccoli florets and garlic cloves with a bit of olive oil. 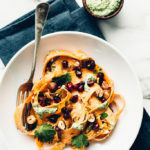 You’ll also slide a tray of pepitas (aka shelled pumpkin seeds) in the oven to toast for a quick few minutes to draw out their nutty, savory flavor. 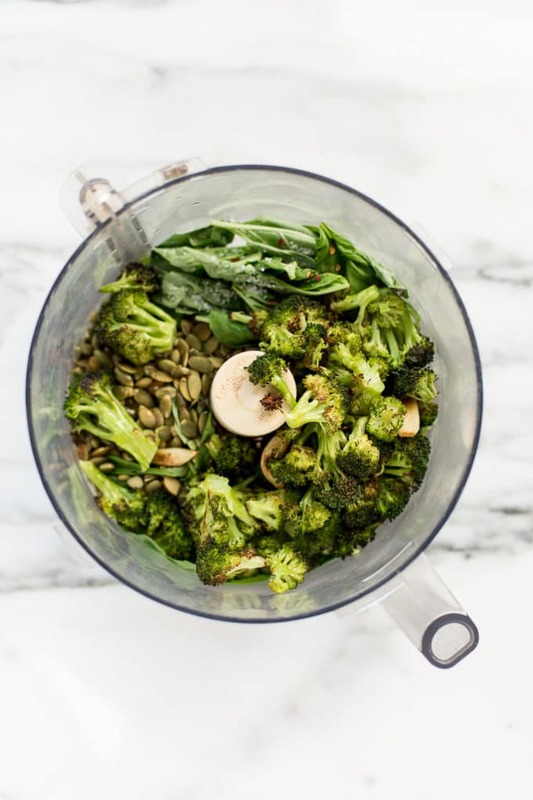 Then, you’ll add the roasted broccoli and garlic to a food processor along with the toasted pepitas, lots of fresh basil, a bit more olive oil, pasta water (or regular water), a splash of apple cider vinegar, sea salt, and crushed red pepper flakes. 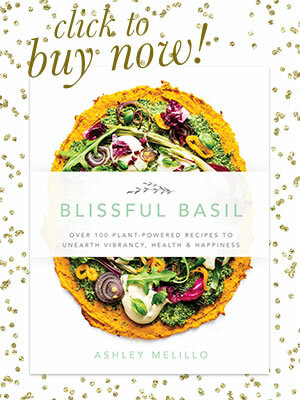 Give it a few pulses and then process until you have a thick pesto. 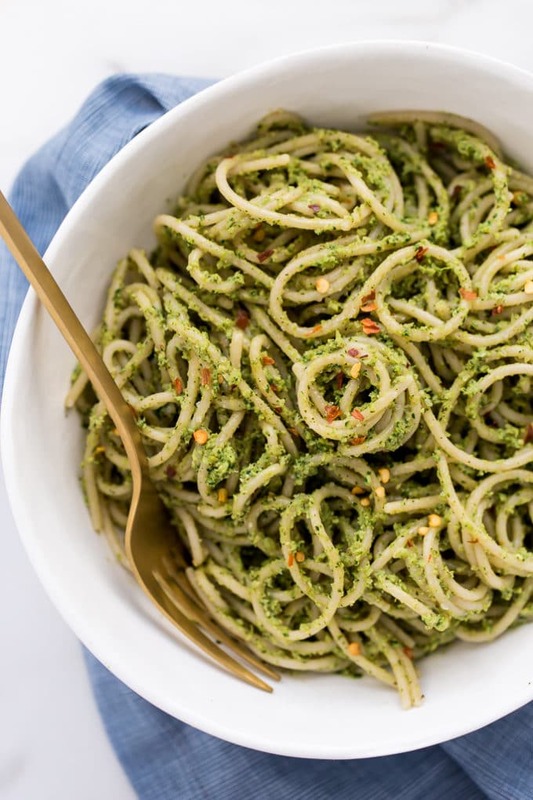 If you want a richer, more liquid-y pesto, substitute some of the pasta water for more olive oil. 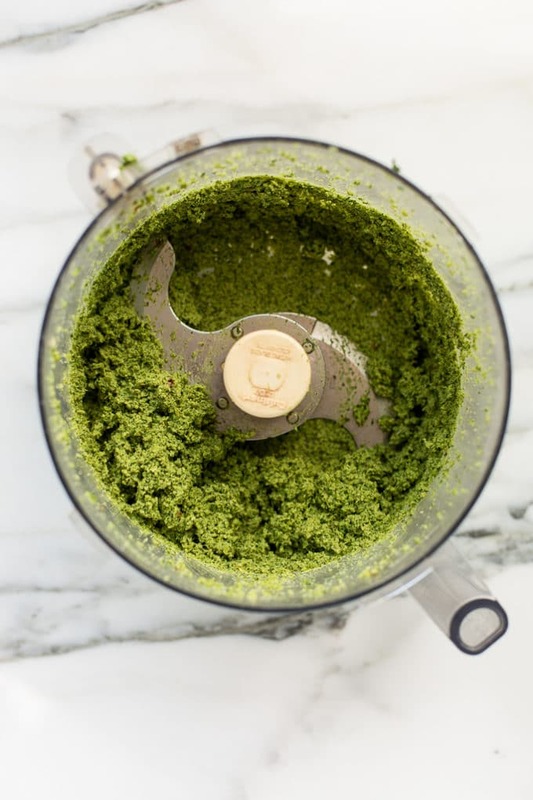 It will yield a consistency that is similar to a classic pesto. It’s delicious both ways. 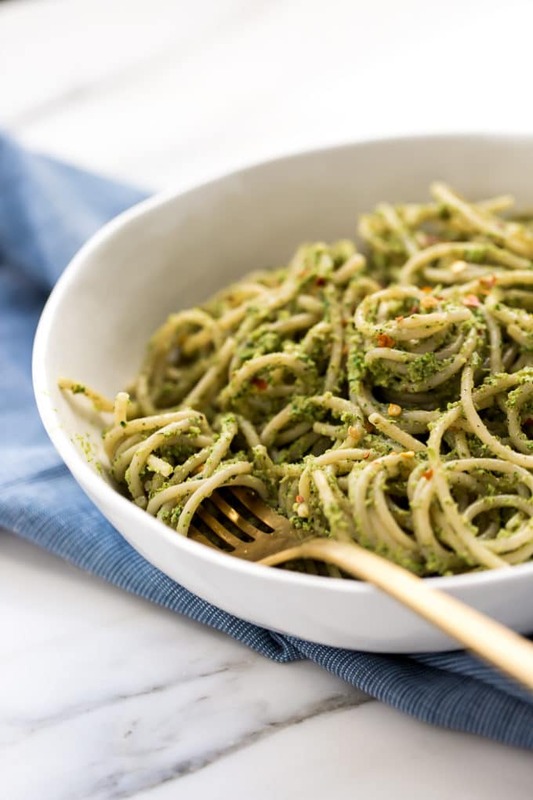 Once you have your pesto ready, spoon it over cooked brown rice pasta and toss to coat, adding in more pasta water as needed to thin. Then, generously season with sea salt, black pepper, and crushed red pepper, to taste. Serve warm and by the bowlful. 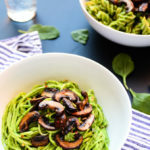 This vegan and gluten-free roasted broccoli-pepita pesto pasta is intensely satisfying. Plus, it's packed with calcium, iron, vitamin k, vitamin c, chromium, folate, manganese, vitamin e, and magnesium. Preheat oven to 400F. Line a large baking tray with parchment paper. Bring a large pot of salted water to a boil. Add the pasta and cook until al dente. 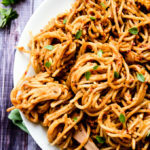 Drain, reserving 2 cups of the pasta water, and return the cooked pasta to the pan. 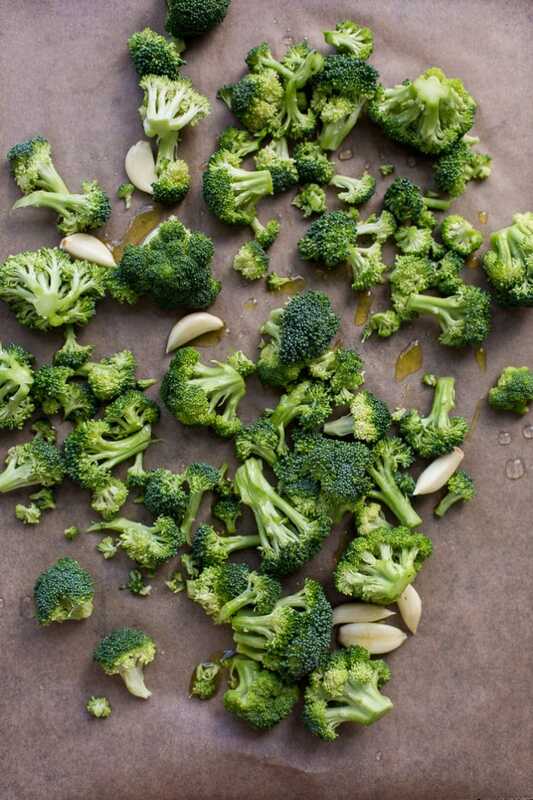 Spread the broccoli florets and garlic out evenly over the lined pan, drizzle with 1 tablespoon of the olive oil. Roast for 18 to 20 minutes or until tender, flipping at the halfway point. Spread the pepitas out over a small baking tray. Bake for 3 to 4 minutes or until lightly toasted. 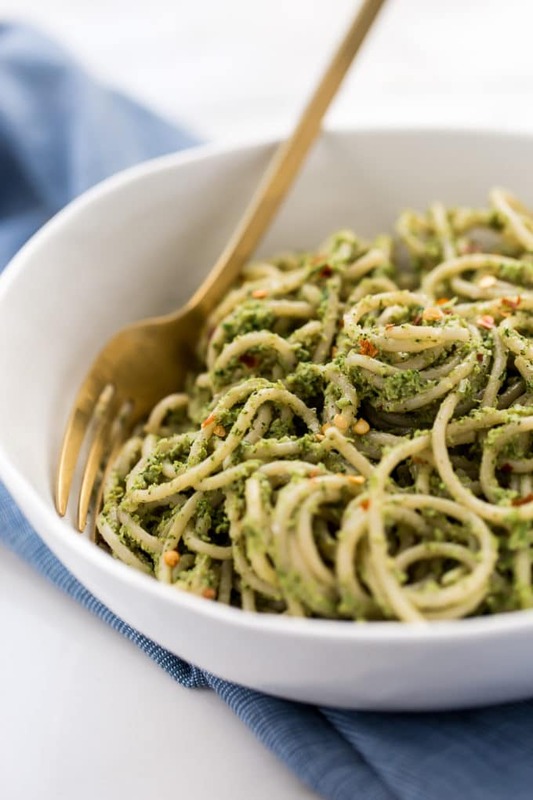 Add the roasted broccoli, garlic, pepitas, remaining 2 tablespoons of olive oil, basil, 1/4 cup pasta water, apple cider vinegar, sea salt, and crushed red pepper flakes to a food processor. Pulse several times and then process until you have a coarse pesto, stopping to scrape down the sides as needed. Taste and adjust seasonings. 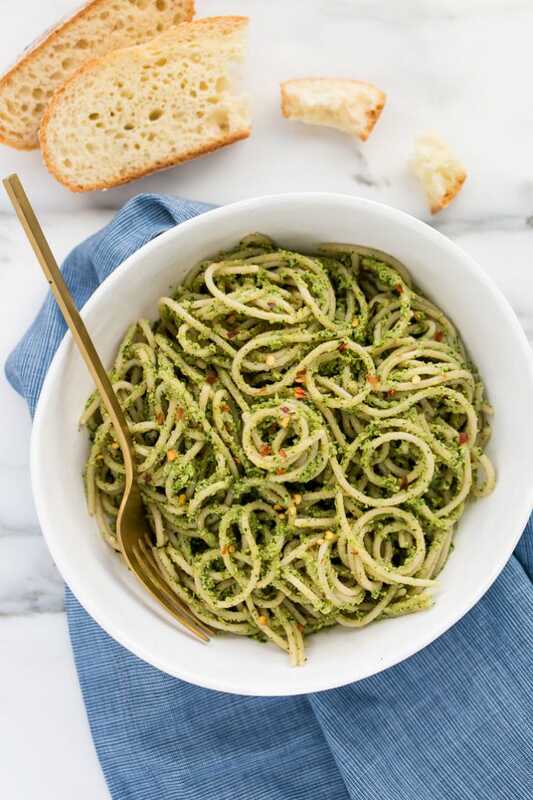 Spoon the pesto over the pasta and toss to coat, adding pasta water, 1/4 cup at a time, as needed to thin the sauce. Generously season with sea salt and crush red pepper flakes, to taste. 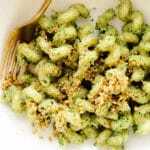 *For a more traditional, richer pesto, substitute 2 to 4 tablespoons more olive oil for the pasta water. hi, I made this tonight and it was a hit. I might adjust the amount of red pepper flakes the next time I made it, since my boyfriend sensitive to spice. Thanks for sharing. Hi, Nicole! I’m so glad it was a hit! Thanks for taking the time to come back and share your feedback. 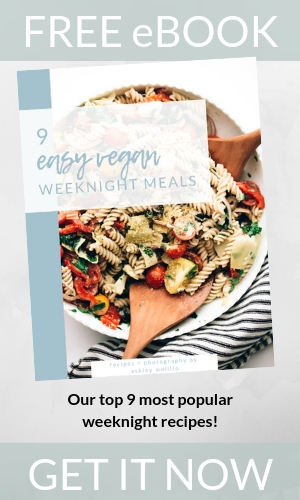 I’ll add a note in about seasoning to taste with the red pepper flakes; I’m a bit of a heat addict and need to remember that not everyone enjoys it quite as much! This was so good! I used walnuts instead of pumpkin seeds since we were all out. It turned out great. I’ve never been a big fan of pesto but since I love broccoli, I thought I’d give this one a shot. And I loved it. Thank you so much!